Living Colorfully: Blog Love, Bloglovin', And Free Sponsor Spots! I'm hoping you all have today off like I do, but if not, I hope you're Monday is off to a great start! I figured there's no better way to start off a Monday than a little housekeeping. I am now accepting Ad Swaps through Passionfruit! If you head to my Sponsors page you can see all the details. Basically, you use the code FLORIDA to get a 200x200 space for FREE. Until April 1! Please remember that this is a swap, so don't forget to stick my button on your blog too! UPDATE! As of 10am, all 12 spots are taken! Thank you SO much for making a girl feel loved! Come April I will have more options, and there will still be some swap options if that's what tickles your fancy. I know the Ad says you can reserve your spot for March 31, but this ad will no longer be running come March 31. If you already booked it for then I'll be in touch on what size I'll be switching my swap option to. Otherwise, please wait until April and we can get this sponsor party started! Secondly, thanks to Florida's famously slow mail (seriously, a card from NY took almost 2 weeks! ), I didn't get my Valentine's Day goodies in time for the link-up, but they were more than worth the wait! 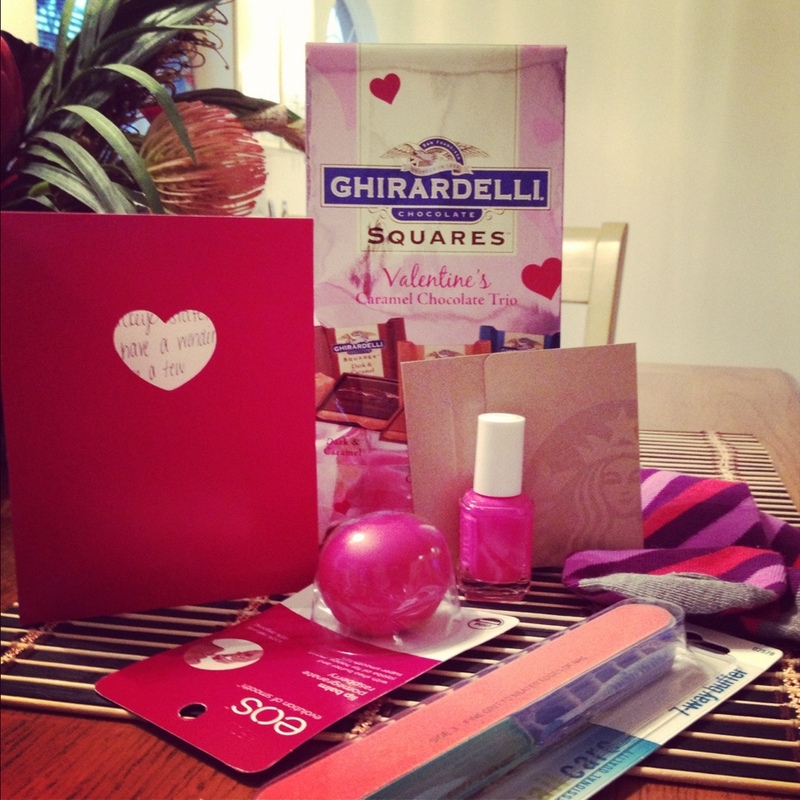 Hannah spoiled me with all my favorite things, and the amount of pink was just perfect! Dom managed to get his hands on the caramels, so I'm not sure how they tasted..but I have a feeling they were amazing! ;) Thanks again, Hannah! I have used Bloglovin' in the past just to follow a few of my favorite blogs so I could read them on my phone. Then, I read that Kaitlyn used it to organize her blogs and decided to try it too. I am not joking when I say it completely changed the way I read blogs. Have you ever opened Blogger and gotten so overwhelmed scrolling through the hundreds of blogs you follow that you just give up, and end up missing out on posts by your favorites? Maybe it's just me, but sometimes I find my blog roll so daunting that I just walk away. This weekend I sat down with Bloglovin' and took the 160 blogs I actually follow along and put them into a category. I used Favorites (the blogs I must read daily, bloggy bffs, Kelle Hampton), 20-Somethings, Mommy Blogs, Wedding/Marriage, Travel, Food, Fashion, and Beauty. So, if I only have 15 minutes? I click right to my favorites and read through them. If I am suffering an exceptionally bad bout of wanderlust? I hit travel and go to town. Want to hear about fun date nights, drunken nights, and hilarious antics? My 20-somethings have that covered. I could not recommend this more if you're like me and are always trying to "keep up" with work, life, and blog land! p.s. am I the only one way too excited for Teen Mom to start again? Why can't I stop watching? I may have to take you up on the swap! EOS lip balm is the best! & Girl... I cannot wait for Monday nights JUST because of Teen Mom 2. I'm obsessed. I never got into the other one so much, but I watch that one as well! you are NOT alone with your love for Teen Mom! I can't wait for it to start again tonight!! :-D lol Idk why I love that show sooo much, but I do! I just started my blog lovin account and am excited to get it all organized. I love organizing. Haha have a great Monday. Yay for a button swap. I just added yours! I can't get enough of the Teen Mom drama either. I was surprised they're doing 12 more episodes and then realized there's just so much craziness going on, how could they NOT air it all? AHHH revenge!! So glad that you watch it! I was freaking out last night. So intense. I'm on bloglovin and I'm following you on it...I'm loving it! ps: Want to swap with me?! Those caramels are yummy!!! Is that essie color secret story? I just got those socks yesterday!! Following on bloglovin now! I am going to have to organize mine now! I totally would do the swap with you if I even HAD a button. (I don't even know how to make one)...You'd think My Blog would be more organized and better looking because I've blogged for so long...Nope. I am Blog Challenged!. Oops! I'm your newest follower! I clicked through one of your sponsored spots (So sorry, I forgot which one!). Robin,I just wanted to let you know I am your newest member to The Sunshine Diary and I already LOVE IT! As a southern girl,I wanted to sponsor you RIGHT AWAY when I saw you were a northerner who loves the SOUTH! I will be on the waiting list for next month! Cannot wait to follow your precious blog! Darn! I totally missed that swap opportunity! Im excited too, if the first season was good, this second part is CRAY! I am loving your treats for valentines day especially the pink essie nail polish! Holy moly, more stuff I need to learn about! But this sounds super useful and a must have. Thanks Robin for the tip! I am actually watching Teen Mom from last night right now...love it!